The Pontiac G5 is a compact car that originally debuted in non-American countries such as Canada and Mexico for the 2005 model year. It was not until the 2007 model year that the G5 was introduced for sale within the United States. Internationally, the compact is also known as the Pontiac Pursuit, Pontiac G5 Pursuit and Pontiac G4. As an entry-level compact, the G5 directly competes with such vehicles as the Honda Civic, Mazda Mazda3 and Mitsubishi Lancer. 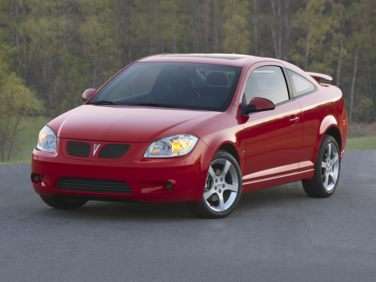 With the exception of a few cosmetic differences, the Pontiac G5 is essentially a clone of another GM compact car, the Chevrolet Cobalt. Both vehicles are based on the GM Delta Platform, which is also used as the skeleton for the Chevrolet HHR, Saturn Ion and Saturn Astra. Unlike the Chevrolet Cobalt, the G5 is only available in 2-door coupe form (although a 4-door sedan version is available in Canada and Mexico). With a length of 179.8 inches, width of 67.9 inches and height of 55.6 inches, the Pontiac G5 is currently the smallest vehicle in [Pontiac]'s lineup. On the inside, the G5 features a simple, sporty design. Hard plastics make up the majority the interior, but are broken up by strategically placed metallic accents on the steering wheel, doors and gear shifter. The dash is dominated by a logical placement of gauges and a quality stereo system. There are two trim options for the Pontiac G5 – a base model and GT model. The base model is available with a variety of features that include 15-inch steel wheels, pass-through rear seat, air conditioning, keyless entry, power accessories, XM satellite radio and an audio system with CD player and MP3 capability. Comfort and convenience upgrades on the G5 GT include 17-inch alloy wheels, cruise control, OnStar, leather-wrapped steering wheel with radio controls and a high-end Pioneer sound system. The base engine for the Pontiac G5 is a 2.2-liter Ecotec 4-cylinder engine that delivers 148 horsepower and 152 lb-ft. of torque. The Pontiac G5 GT comes standard with a more powerful 2.4-liter 4-cylinder engine that accomplishes 173 horsepower and 163 lb-ft. of torque. Both trim levels feature a standard 5-speed manual transmission, with the option of upgrading to a 4-speed automatic. Additional performance features found on the GT model include fog lights, a sport-tuned suspension and high-performance tires. Estimated EPA fuel efficiency for the 5-speed base G5 is 25 mpg city and 35 mpg highway. The 5-speed GT compromises efficiency for performance, dropping to 22 mpg city and 32 mpg city. Both vehicle models outfitted with a 4-speed automatic deliver 22 mpg city and 31 mpg highway. An XFE upgrade package is also available for drivers seeking extra fuel efficiency. The package includes a revised engine calibration, special axle ratio and low-rolling resistance tires. The base G5 comes standard with dual front airbags, front side airbags, side curtain airbags, daytime running lights, emergency trunk release and tire-pressure monitor. The GT adds anti-lock 4-wheel disc brakes and an antiskid system. The NHTSA awarded the Pontiac compact with 4 stars in the categories of driver front impact, rollover resistance, driver side impact and rear passenger side impact. A perfect 5 stars was awarded in the category of passenger front impact. The 2009 Pontiac G5 has several changes to it since the 2008 model year. The G5 has a better fuel economy rating this year with a combined rating of 37 being attributed to a more efficient engine that delivers more power without using more fuel. The new engine is a 2.2 liter, four cylinder Ecotec engine that uses variable valve timing. There is also a new final drive ratio on G5 models that have manual transmission. The new ratio is 3.63. The G5 has new tires in 2009. The new ones are 15-inch tires that have low-rolling resistance. Other new standard features in the G5 include the capability of Bluetooth technology and a new USB port that is iPod compatible and located in the radio. There are also a few design differences n 2009. Externally, there are two new colors available- Silver Green Metallic and Quicksilver Metallic. The interior gets a new look with a new combination for the interior trim colors- Red/Ebony leather. The driver and the front passenger now have a new dual-stage inflatable airbag that are low risk and that use a passenger sensing system. The new engine produces 155 horsepower and 150 foot pounds of torque. The Old engine in the G5 had 148 horsepower and 152 foot pounds of torque in the 2008 models. There is no longer a 2.4 liter, 171 horsepower option on the new G5 models. There are two trim levels available with the G5- the base model and the GT model. The 2.2 liter engine is standard on both trims, though the different tires, wheels and other small differences give the two trims slightly different fuel economy ratings. The GT trim level also has 17-inch wheels made from alloy and fog lamps that set it apart from the G5 base model.